Earlier this evening, having repudiated First Life completely, because I'm tired of using a cane to get around, I packed up my stuff and moved to Second Life. That place lets me fly, teleport and spend money. I don't see any of that happening in First Life. Especially the money spending. And downloading Quick Time. How different it all is. 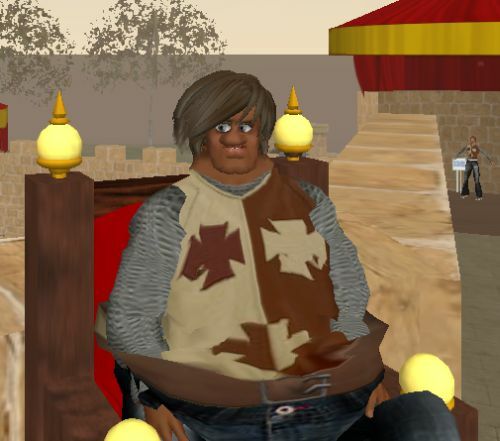 As you can see, I have taken advantage of Second Life's flexibility to reinvent myself as a jut-jawed broken-nosed pouty-lipped coconut-coloured bow-legged wide-butted paunchy chevalier of my new country. A country that I call WhycantIteleportoffthisislandia.